Ecopole: Could a combination of wind and solar beat out traditional solar for street lights? Halide lights consume a good deal of energy and put of a great deal of heat to light our streets at night. This has caused some to look towards solar street lights as an alternative to the wasteful halide lights. Solar lights have long been used in small applications such as sidewalk lighting, but it looks to make the jump into the market of city street lighting - however, there are some problems with the all solar street light. 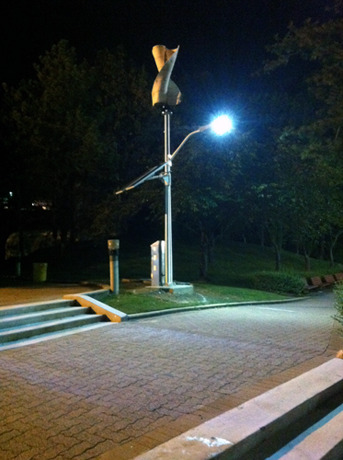 The good folks at Fort Knox have installed a number of solar LED street lights in an effort to go greener. Through the use of street lights that run on renewable energy, there is no carbon footprint associated with keeping the streets safe and well lit. However, just like the sidewalk lights many of us have in our yards, these lights are dependent on the sun to keep a charge and thus be able to adequately light the streets at night. We are not blessed with a bright, shining sun everyday of the year, which means that these lights can be unreliable, especially during periods of cloudy weather. This lack of reliability led to folks at Fort Knox to consider a different solution. They are now planning on installing a streetlight that runs on a combination of wind and solar. This provides a sort of "fail safe" mechanism that will give the light some way to charge even when it is cloudy out. SavWatt, the creator of the Ecopole solar-wind powered street light claim that this is a much more reliable alternative to the all solar street light. While a street light that has no carbon footprint is not likely to seem like an altogether big deal in the scheme of going green, these little changes can make a big difference. Besides, just think about the number of street lights in your own community and think about what this adds up to as a nation. Switching this fleet of inefficient halide lights to lights powered by the sun, wind, or both, would make a big difference.